The following illustrated proof for the diabolical & extreme Unsolvable #13 employs an imposing variety of techniques. Advanced Forbidding Chains would be my general description of the toughest ones used herein. Any technique, including primarily a Forbidding Chain (also called Alternating Inference Chain (AIC) may be used as an argument in the chain. If this is your first visit to this blog, WELCOME!! 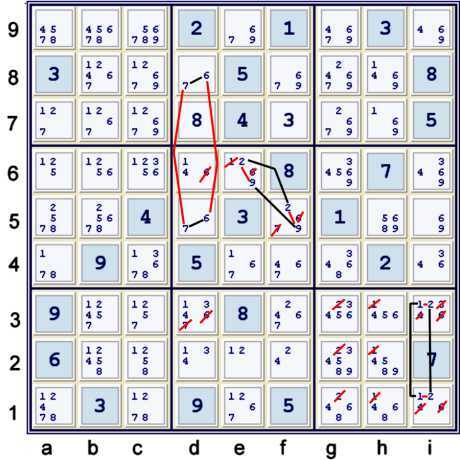 This puzzle is meant to be very difficult, thus the proof is far from trivial. Please accept my gratitude for your forbearance! Hidden Pairs are generally the next thing that I look for. 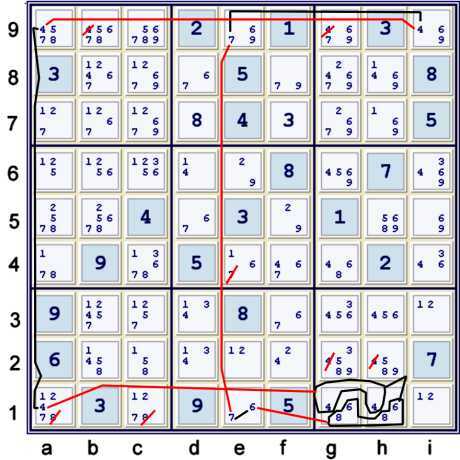 All of these techniques are illustrated as wrap-around, or continuous, forbidding chains (AIC). At this point, we have exhausted the easy techniques. 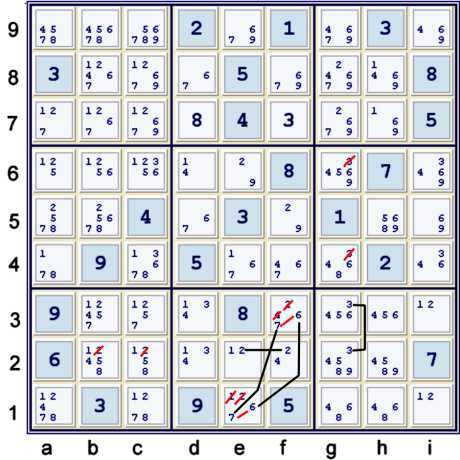 To get things started right, I shall jump right in with one of the most complex steps this puzzle requires. Thus, if e9=69, then we have remote pairs 69 at e9,i5 => i9≠69. The step illustrated below uses that precise piece of information. Please note, however, that a proof by contradiction of this piece of information is not the only derivation possible. In fact, it is not my preferred derivation. Rather, it is included as added weight in the following step. The macro chain, if you will, is a continuous loop, as the endpoints, e9=7, e1=7 are in conflict with each other. The contained Boolean A is also a continuous loop, but.... its connection to the macro chain is asymmetrical. By that, I mean that it does not use the weak links that would be proven strong to connect to the macro chain. A whole bit of theory could be developed here, but suffice it to say that, as far as the macro chain is concerned, A is discontinuous. Thus, none of its internal weak inferences are proven strong. 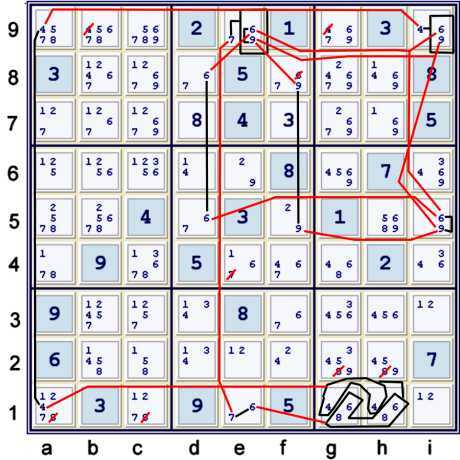 What I mean by unconditional, is that all of the strong links used in that portion of the chain exist in the current possibility matrix. Thus, one has that elimination no matter what. Hopefully, this is almost as clear as mud. A future blog page may entertain theorems that exhaustively analyze partially continuous loops. I believe the name, Almost continuous nice loops is used elsewhere to describe partially continuous loops. Find above an attempt to clarify this elimination group. The Almost Remote Pair portion of the chain has been removed. Also, the one elimination based upon that portion of the chain has been made. The last of these conclusions is perhaps the hardest to understand, but in a continuous loop chain, not only are all the weak inferences proven strong, but all the strong inferences are proven weak. Since the macro chain already considers all the contents of the cells, gh1, we are not using any new information to make this elimination deduction. This concludes the first page of this proof. There remain some very interesting steps. To find some of these, please visit the next page. 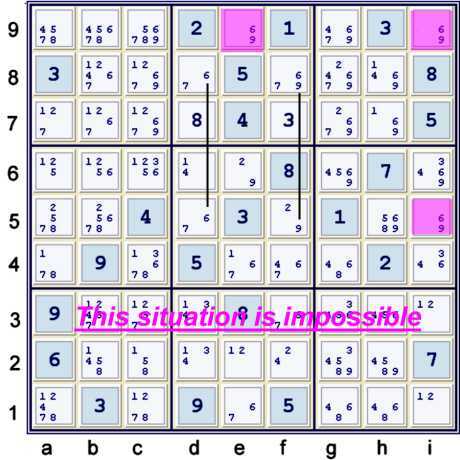 If you click the link 'Unsolvable #13', you'll find this is a puzzle from another site, purported to be...well...darn near unsolvable. 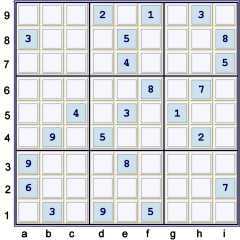 I solved this puzzle this morning, in less than an hour....it's not unsolvable. We know it is not unsolvable. The name is a bit of hyperbole. But not much overstatement, in my opinion. Please let us know what path you took to achieve your solution. We would be greatly interested.